Gorillas are part of the great ape family, which includes orangutans, bonobos and chimpanzees. They are predominantly ground dwelling, and inhabit forests located in numerous countries in central Africa. Gorillas are third in line as the closest relatives to the human. Chimpanzees take first place followed by bonobos. They are the largest living primates today. Predators: No Natural Predators. Humans & Occassionally Leopards. In addition to being stocky, gorillas have broad chests and shoulders. They also have large hands with forearms that are shorter than their upper arm. Gorillas have a black and hairless face with large nostrils and small eyes that are set closely together. There are actually two distinct species of gorillas, the eastern gorilla and the western gorilla. 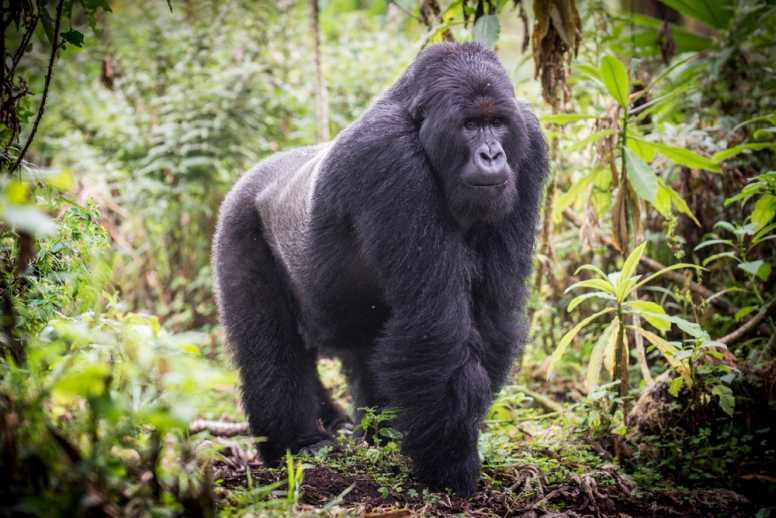 The eastern species (Gorilla beringei) lives specifically in the east central part of Africa, and the western species (Gorilla gorilla) inhabits the west central part of Africa. The eastern gorilla are the larger of the species and have darker and longer fur. Adult male gorillas known as ‘silverbacks’, due to silver hair on their backs, are generally larger than their female counterparts, and can weigh between 136 to 195 kg (300 to 430 lb) and be as tall as 4 ft 7 in to 5 ft 11 in (1.4 to 1.8 m). Unfortunately all species (and sub-species) of gorilla are currently listed as critically endangered on the IUCN Red List due to habitat destruction, poaching for the bushmeat and wildlife trade. 1. Of the two species of gorillas, each has two lowland and upland subspecies. The western gorilla is split into two different subspecies including the Cross River gorilla and the Western Lowland gorilla. The eastern gorilla species includes the Mountain gorilla, and Eastern Lowland or Grauer’s gorilla. 2. The two subspecies have very different habitats. The gorilla is mostly restricted to countries in central Sub-Saharan Africa, but the various subspecies live in different elevations. The mountain gorillas are known to inhabit higher elevations up to 4,300 metres above sea level. The lowlands species tend to stay near the valley floor in the thick rain forests on the Atlantic Coast of Africa. 3. Of the various subspecies of gorillas, two have small populations left on the planet. 4. Gorillas are the largest primate, with the tallest Silverback recorded at over 6ft 5in and heaviest at over 590 pounds (265 kg). That’s roughly 3 times heavier than an average man, when their height is somewhat similar. This indicates just how broad and muscly gorillas are. They out rank monkeys, lemurs, chimpanzees, orangutans and humans as the largest primate. If you were to be chased by a gorilla, you better have wheels underneath you as they can reach speeds of over 20 miles per hour with a top speed clocked at 25 Mph. 6. They are highly intelligent, and can learn words. 7. Mountain gorillas are generally larger, with longer, darker hair and tend to have shorter arms than their lowland gorilla cousins. They also generally have a larger nose and jaw, and teeth, too! 8. Gorillas move around by knuckle-walking. This is when they rely on their knuckles (or other parts of their hands) to walk and shift location. 9. Gorillas live in ‘troops’. A ‘troop’ is a group of up to thirty gorillas, which often consistent of a dominate male gorilla, a handful of females and their immature offspring. 10. Gorillas have a fairly long lifespan. Gorillas can live generally between 35 and 40 years in the wild. Those who are kept in zoos fair better and can live for 50 or more years. One female gorilla in a zoo in the United States lived to 60 years of age. 11. Gorillas stand in similar heights as humans. An adult male gorilla will stand between 5-feet, 7-inches to 6-feet tall. Females are slightly shorter. 12. Gorillas arm span is significantly longer than their body height. 13. They rarely go ape about anything. Gorillas are considered to be peaceful creatures. However, there are times when a younger male will challenge a more mature one. They will typically just make a lot of noise, beating chests, baring teeth, charging forward and waving sticks until one backs down. 14. Gorillas are not meat eaters. The gorilla diet is mainly vegetarian, which includes fruit, bamboo shoots and plant stems. They also rarely drink water, as they can get all they need from the foods they consume. Adult gorillas can eat up to 30kg of food each day. 15. They have a large repertoire. 16. There is no clearly defined mating season. Gorillas can mate any time of the year. Females mature between 10 and 12 years of age and males mature between 11 and 13 years. The gestation period is roughly 8 and-a-half months. 17. The mother and baby gorilla spend a lot of time together. A newborn gorilla will weigh between three and four pounds. The mother will carry it around against her chest for a number of months until the baby can hang on to her back. 18. The young gorilla learns fast. A baby gorilla will learn how to walk by the time it reaches six months of age and it will be able to follow its mother for short distances once it gets to 18 months of age. Riding on Mom’s back is the safest place for the baby, even at this point in its life. It will stay with its mother until it is four to six years of age sharing her nest all the while. 19. The young gorillas continue learning as they grow. Young gorilla will learn just by imitating what it sees others around him or her doing. In fact, this is how a young gorilla will pick up many different actions and will act them out in play fights with other young gorillas. 20. Gorillas are always on the move. A group of gorillas is called a troop. The troop will not spend more than a day in the same place and it is believed that this is to allow food to replenish itself after the troop moves to another location. The new location is picked by a silverback gorilla, which is more or less the leader of that troop. Food is the determining factor as to where the gorillas will move today and tomorrow. 21. Gorilla building is believed to be more than just art. Nest building by gorillas is no longer looked upon by researchers as just being a fine example of animal architecture. They are now saying that nest building demonstrates great tool use by the primates. 22. Gorillas are poor swimmers. As they are unable to swim naturally, gorillas will avoid rivers and large bodies of water. “Gorilla gorilla ssp. diehli (Cross River Gorilla)” (2016), via IUCN Redlist. “Why Koko The Gorilla Mattered” (2018), via National Geographic. “Human Body Ratios” (2017), via Scientific American. “How we’re learning to speak gorilla” (2015), via BBC Earth.